I bought and fitted a brand new power steering pump. As i stated in another post the fluid keeps erupting when i switch the engine off. I have now found out its a faulty pump. The shop i bought it from tell me it costs more to ship the item back to America then it is worth. The fault with the pump is the flow control valve is not working as it should. The shop said they would order a new flow release valve for me, I am happy with that solution as long as its possible. The shop say that you have to unscrew the fluid pipe from the back of the pump. Then unscrew the nut on the back of the pump where the pipe fits in. You can then remove the faulty valve and put the new one in there. The shop are struggling to find replacement online. Does anyone know where the flow control valves are available? I have taken them apart but do not remember the valve? I tried to take my pump apart on the 73 to put a seal kit in but could not get the pulley off. I broke one puller and it actually bends the connection on the pulley. Tried heat and soaking could not get it off. As long as you do not have to take the pulley off you should be ok. The pulley has to come off to take the screws out of the front to get the mounting bracket off so you can pull the can off the pump. You can see on the right hand side where the fluid pipe screws onto there is a nut there which is supposed to unscrew and give you access to the flow control valve. The valve is supposed to come out through there and you can replace the valve. Steve, I have posted detailed pict of a pump rebuild and you can see that valve. As David says, you will need to extract that pulley. You need a specific tool for this that get its grip from the extra small groove on the pulley. I have this tool, and can give you the snap-on ref number may you fail to borrow one. Its not a tool you'll need often (prolly once or twice) and isn't cheap, but without it, you will not remove this pulley without damaging it if you managed to remove it at all. But with it, it's coming off in matter of seconds like if that pulley is not resisting at all. Aside this valve and tool, you will need a rebuild kit ($12 at CJP) as you may be able to put back the o-rings that should not be bad if pump if not old, but there are gaskets for the back that you will need to change that are not reusable. 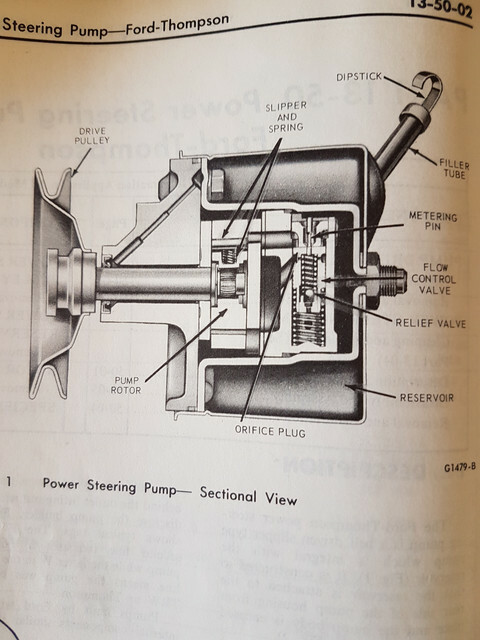 (04-11-2019, 01:17 PM)Fabrice Wrote: Steve, I have posted detailed pict of a pump rebuild and you can see that valve. Good plan! Their problem not yours.